The United States Mint reported lower revenue and net income for the numismatic program for the fiscal year ended September 30, 2012. Overall revenue fell by 33.3% to $481.2 million, while net income and seigniorage fell by 34.7% to $73.9 million. 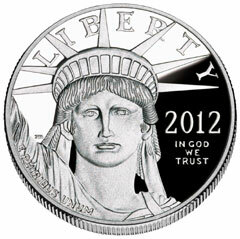 This article continues coverage of the United States Mint’s 2012 financial results. The numismatic program of the United States Mint includes high quality versions or specially packaged circulating coins, precious metals coins, commemorative coins, and medals which are offered for sale directly to the public. Some products are required by federal statute, some are required under individual public laws, and others are created at the discretion of the Secretary of the Treasury. A main objective of the numismatic program is to increase the customer base and foster sales, while controlling costs to keep prices as low as practicable. Following the exceptional performance of fiscal 2011, numismatic program revenue declined in the latest fiscal year. The decline was primarily driven by lower sales of gold and platinum proof coins as well as lower sales for core annual sets. For the 2012 fiscal year, sales of gold and platinum numismatic products saw a decrease of $208.4 million compared to the prior year. This alone accounted for 86.7% of the overall revenue decline for the numismatic program. The comparatively lower sales were the result of atypically high sales during the prior fiscal year when products made their return after a one-year cancellation resulting in a great deal of pent up demand. A decline in revenue from core annual numismatic sets was attributed to later sales dates compared to the prior year. In the prior fiscal year, the US Mint had released sets earlier in response to customer feedback. For the current fiscal year, the release dates reverted to their typical time frames. The annual core sets generated an operating loss of $2.7 million for the 2012 fiscal year. The US Mint had reduced prices for certain sets in order to encourage greater price accessibility for a broader range of collectors. Quarter products also generated a slight loss for the fiscal year. The net income generated from Presidential Dollar products more than doubled for the 2012 fiscal year. This was attributable to the Treasury Department decision to suspend production of the coins for distribution to circulation, which resulted in increased orders for the numismatic bags and rolls. Starting with the 2012-dated releases, the only way for the public to obtain examples of the new releases was to order the related US Mint numismatic products. Silver products saw an increase in revenue due to the release of special sets including the 2011 Silver Eagle 25th Anniversary Set (in the fiscal first quarter) and the 2012 San Francisco Silver Eagle Set. The net margin for silver products remained robust at 32.69%. Leslie – bear in mind – the Mint is a US government department – don’t hold your expectations too high!